alaTest har samlet og analyseret 601 anmeldelser fra magasiner og hjemmesider. Anmeldere kan virkelig godt lide støjen. Også præstationen imponerer, men mange er mindre positive med hensyn til værdien for pengene. Gennemsnitligt vurderede brugere dette produkt til 88/100 og eksperter vurderede dette produkt 75/100. Still, there's something about having prints instead of staring at a screen, and that's what makes Fujifilm's little portable printer so nice. The portable, lightweight Fujifilm Instax Share SP-1 photo printer quickly turns your smartphone photos into small instant prints. It's easy to operate and use. The iOS and Android apps offer some fun editing, print options. The printer's price is maybe a touch too high for an impulse purchase and the cost-per-print might also be a bit much. Merging old and new, Fujifilm's Instax Share SP-1 is a fun, portable wireless instant photo printer worth picking up if you don't mind the costs. Yes, it's a bit of a niche product, but if you like a fun, simple way to turn your smartphone shots into little prints, the Instax Share SP-1 printer is worth picking up. The Fujifilm Instax Share SP-1 portable dedicated photo printer comes with a high cost per photo, but it's small, prints high-quality images quickly, and is fun to use. Fast, fun, photo printing from Android or iOS smartphones and tablets. Easy to set up and use. High cost per photo. Credit-card-size photos have large borders. Actual pictures are only 1.75 by 2.47 inches. If you're like most people I know, you take a lot of snapshots with your smartphone. And, sure, you probably occasionally flip through them to show shots to your friends and family, but you probably rarely if ever print them -- for yourself or others. Idiot-proof and a lot of fun, the Instax Share brings back the joy of sharing photos. However, the film can be pretty expensive. Test : Fujifilm Instax Share SP-1, transformez votre smartphone en Polaroid ! En transformant n'importe quel smartphone en "vrai" appareil photo instantané, la Fujifilm SP-1 combine la douceur de l'argentique et la souplesse du numérique. 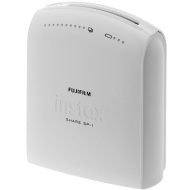 Fusionnant tradition et nouveauté, la Fujifilm Instax Share SP-1 est une imprimante photo instantanée, portable et sans fil, amusante, à envisager si vous faites abstraction des coûts.